On her way to cotillion, Serena wore this gorgeous gray lace Zuhair Murad gown with a draping waist sash. Honestly, who else could pull this off no perfectly? Ignore her UGG boots on underneath, this pic was shot on set before shooting. No one can quite compare to Blair Waldorf. Her flair for fashion and scheming never fails to ignite some sort of drama in the show. 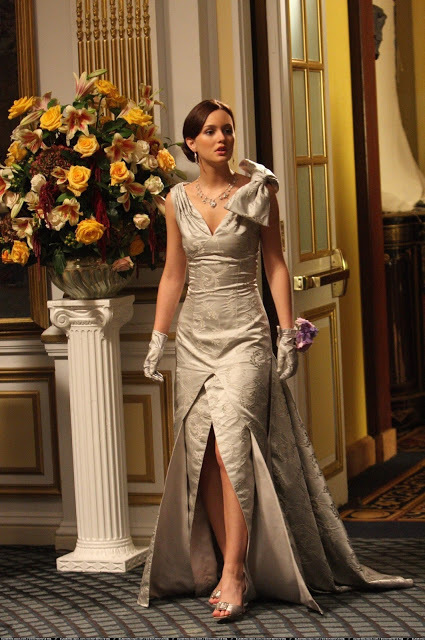 This dress was specially designed for Blair by stylist and costume designer Eric Daman, who created this dress especially for the cotillion episode. Very Carolina Herrera huh? One of my favorite episodes has to be when Blair and Serena go to Paris for the summer. Not only does Blair fall for a prince, they dine and shop at some of the most exquisite stores known to luxury. Blair is wearing a mixed print Moschino dress and a fab beret while Serena dons a Georges Chakra basket weave dress with a Rag & Bone blazer. Parisian fashion at it’s finest. For Americans at least. Who could forget Lil’ J? Dan’s little sister Jenny made a huge splash into the NYC social scene with her aspirations to reach the top of the Manhattan elite. While she did ultimately have a infamous downfall from her temporary throne, who can forget her outfits?! By the way, this is just her school uniform. So unfair!!! I’ve said before I really don’t like thigh high boots but on Serena, well, it’s an exception. In her Phillip Lim coat and sweater dress plus DKNY plaid tights, no one does winter street style quite like Ms.Vanderwoodsen. Speaking of cold weather fashion, Blaire’s Gryphon cape and Fendi leather bag are to die for. A classic Blair Waldorf look. Ah summers in the Hamptons. Even though I’ve never had the pleasure(or the money) to spend my vacation there, I imagine my outfits would look a lot like this. The Peter Som blouse and Stella McCartney floral skirt is to die for. The color pop of the tote bag is perfect as well. Royal blue harem pants have never looked so good. The gold blazer was incorporated into this outfit flawlessly, no one does street style quite Serena. Who can forget Serena’s Ralph Lauren bridesmaid dress? This amazing yellow layered ruffle gown was stunning at Lily and Rufus’ wedding in season 1. Oh my Oscar. Blaire wore this breathtaking Oscar de la Renta gown in Paris with fuchsia heels for her dinner date with Prince Henrí. Last, but certainly not least, Blair’s Elie Saab baby blue wedding dress. This season finale outfit had us all oohing and awhing as Blair married Chuck in a dramatic last second wedding. It kills me to see this show end, but at least it ended with a fashionable bang.